Lunar tourism may be possible in the future if trips to the Moon are made available to a private audience. Some space tourism startup companies are planning to offer tourism on or around the Moon, and estimate this to be possible sometime between 2023 and 2043. Sketch of circumlunar free return trajectory. Tourist flights would be of three types: flyby in a circumlunar trajectory, lunar orbit, and lunar landing. Some of the space tourism start-up companies have declared their cost for each tourist for a tour to the Moon. Circumlunar flyby: Space Adventures is charging $150 million per seat, a price that includes months of ground-based training, although this is only a fly-by mission, and will not land on the Moon. Excalibur Almaz had the same price tag but never managed to send their capsule to space. Lunar landing: The Golden Spike Company was planning to charge $750 million per seat for future lunar landing tourism. 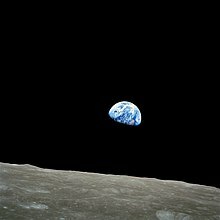 Earthrise over the lunar horizon, as seen from orbit on Apollo 8. 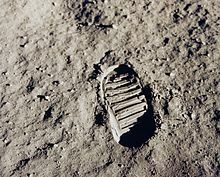 Buzz Aldrin's boot print on the lunar surface at Tranquility Base. The site of the first human landing on an extraterrestrial body, Tranquility Base, has been determined to have cultural and historic significance by the U.S. states of California and New Mexico, which have listed it on their heritage registers, since their laws require only that listed sites have some association with the state. Despite the location of Mission Control in Houston, Texas has not granted similar status to the site, as its historic preservation laws limit such designations to properties located within the state. The U.S. National Park Service has declined to grant it National Historic Landmark status, because the Outer Space Treaty prohibits any nation from claiming sovereignty over any extraterrestrial body. It has not been proposed as a World Heritage Site since the United Nations Educational, Scientific and Cultural Organization (UNESCO), which oversees that program, limits nations to submitting sites within their own borders. An organization called For All Moonkind, Inc. is working to develop enforceable international protocols that will manage the protection and preservation of these and other human heritage sites in outer space. Interest in affording historical lunar landing sites some formal protection grew in the early 21st century with the announcement of the Google Lunar X Prize for private corporations to successfully build spacecraft and reach the Moon; a $1 million bonus was offered for any competitor that visited a historic site on the Moon. One team, led by Astrobotic Technology, announced it would attempt to land a craft at Tranquility Base. Although it canceled those plans, the ensuing controversy led NASA to request that any other missions to the Moon, private or governmental, human or robotic, keep a distance of at least 75 meters (246 ft) from the site. A company called PTScientists plans to return to the Taurus-Littrow Valley, the site of the Apollo 17 mission landing. PTScientists is a partner of For All Moonkind, Inc. and has pledged that its mission will honor heritage preservation and abide by all relevant guidelines. Space tourism companies which have announced they are pursuing lunar tourism include Space Adventures, Excalibur Almaz, Virgin Galactic and SpaceX. The company Space Adventures has announced a planned mission, titled DSE-Alpha, to take two tourists within 100 kilometers (54 nautical miles) of the lunar surface, using a Soyuz spacecraft piloted by a professional cosmonaut. The trip would last around a week. In February 2017, SpaceX announced it had accepted deposits for a private week-long flyby mission to the Moon, set for late 2018, in a Dragon 2 capsule carrying two tourists, to be launched via Falcon Heavy rocket. The proposal changed in early 2018 to use the BFR system instead, and in September 2018 details were announced of what they call the DearMoon project. ^ Dear Moon. Accessed: 17 September 2018. ^ a b Gilbert, Dave (2013-12-09). "Could Virgin Galactic launch tourist trips to the Moon by 2043? – CNN.com". Edition.cnn.com. Retrieved 2015-08-21. ^ a b SpaceX (February 27, 2017). "SpaceX to Send Privately Crewed Dragon Spacecraft Beyond the Moon Next Year". SpaceX. ^ a b c d e "Fly me to the moon". The Economist. 2012-06-30. Retrieved 2015-08-21. ^ "Shooting for the Moon: time called on Isle of Man space race". The Independent. 2015-03-11. Retrieved 2017-09-11. ^ Lecher, Colin (2012-12-06). "Space-Tourism Company Is Selling Trips To The Moon For $750 Million Each | Popular Science". Popsci.com. Retrieved 2015-08-21. ^ "Space-tourism company to offer two seats to the moon – Americas – World". The Independent. 2012-12-07. Retrieved 2015-08-21. ^ a b c "Space tourism firm offers flight around the moon on Soyuz crafts — RT News". Rt.com. Retrieved 2015-08-21. ^ a b c Chang, Kenneth (January 10, 2012). "To Preserve History on the Moon, Visitors Are Asked to Tread Lightly". The New York Times. Retrieved January 11, 2012. ^ Thomson Reuters (27 February 2017). "SpaceX to fly 2 people around the moon by next year". CBC News. ^ Foust, Jeff. "SpaceX no longer planning crewed missions on Falcon Heavy". Spacenews. Retrieved February 6, 2018. ^ Pasztor, Andy. "Elon Musk Says SpaceX's New Falcon Heavy Rocket Unlikely to Carry Astronauts". Wall Street Journal. Retrieved 6 February 2018. ^ Owen, Jonathan (11 March 2015). "Shooting for the Moon: time called on Isle of Man space race". The Independent. Retrieved 19 April 2017. 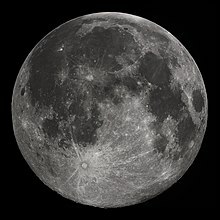 Wikivoyage has a travel guide for Moon. This page was last edited on 3 February 2019, at 14:03 (UTC).